City aviation experts, Professor Chris Atkin and Captain Tilmann Gabriel, discuss some of the recent challenges to solar-powered flight experienced by the Solar Impulse 2 aircraft. 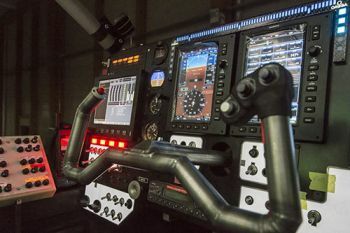 Andre Borschberg and Bertrand Piccard have suffered set-backs in their quest to circumnavigate the earth in an experimental solar-powered aircraft. The Swiss nationals are flying Solar Impulse 2, whose large fixed wing is covered from tip to tip with 17,000 photovoltaic cells providing 340kWh of electric power. Solar Impulse 2 was forced to land on June 1st in Nagoya, Japan, after weather conditions worsened soon after embarking on its longest leg across the Pacific Ocean. Though the aircraft touched down smoothly, gusts of wind damaged its delicate wings in the hours after landing. The aircraft is powered by taking off in the daylight and rising to an altitude of 9,000m as the sun charges its batteries. At night, the engine is switched off and the plane glides down to 1000m. With only 10 percent of its battery charge left, the plane needs to find cloudless sky to charge its battery in the morning so as to fly continuously. Professor Atkin adds that for the Solar Impulse 2, “cloud cover is a definite systemic risk if one needs to have adequate sunlight in order to ascend to 27,000 ft to charge photovoltaic cells”. Captain Tilmann Gabriel, a former airline pilot who is currently the Director of City’s MSc Air Transport/Aircraft Maintenance Management programmes, believes that a combination of environmental regulation and energy efficient aircraft manufacturing techniques will bring about emissions reductions and make flying both efficient and environmentally friendly. He points to attempts by the European Commission to introduce a carbon emission scheme for airline operators. A nacelle is a separate streamlined enclosure on an aircraft or spacecraft for sheltering the crew or cargo or for housing an engine and ts related components.